The department facilities include six laboratory areas: printmaking, wood, metal, video, digital media and ceramics. Each lab is overseen by a professional mechanician who is available most weekdays to answer your technical questions, familiarize you with the equipment and supervise shop use. Labs are available for undergraduates enrolled in art courses and graduate students who demonstrate proficiency with the specific studio processes. Graduate students must coordinate with the appropriate mechanician and faculty for access to these studios. The Art Department maintains and operates its facilities under the guidelines of state and federal environmental policy and practice. The University's Environment, Health, and Safety (EH&S) unit enforces state and federal policy on campus property. Before starting a project, process and materials will be thoroughly reviewed by faculty and the appropriate studio mechanician before access to a studio is granted. Graduate students without experience in a proposed studio process must enroll in an appropriate course that will allow them to realize their project goals. Kroeber Hall: The core of the Art Deparment's activities are located in Kroeber Hall, which houses classrooms for painting, drawing, as well as well-equipped facilities for printmaking, metal and wood sculpture, digital video, sound, and graphics animation production. The main office of the department is located in room 345; faculty offices are on the third floor. The Worth Ryder Art Gallery and Garron Reading Room are also located here. Wurster Hall: Adjacent to Kroeber Hall is Wurster Hall, the site of an extensive ceramics studio and classrooms for undergraduate sculpture. Three graduate studios are located in Wurster Hall. UCB offers all levels of fine art printmaking. 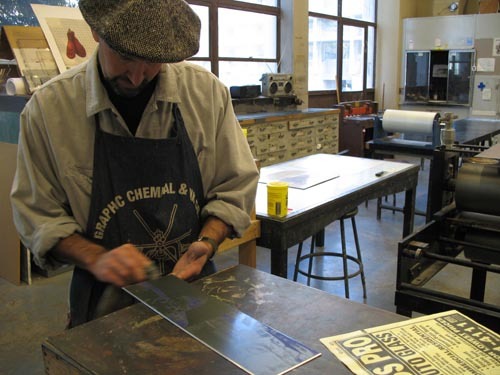 The printmaking program has had an illustrious history at Berkeley. The studios were originally designed by Karl Kasten and over the years have prospered from the remarkable teachings of George Miyasaki, Shane Weare, Sylvia Lark, Don Farnsworth, Barbara Foster and Randy Hussong. The printmaking facilities are located on the second floor in Kroeber Hall. The two studios are shared by both undergraduate and graduate students and include equipment for stone and plate lithography, intaglio, silkscreen, relief, monotype, and digital and photo processes. Both studios are well ventilated and equipped with several safety eyewashes, and non-toxic practices and technology are observed wherever possible. 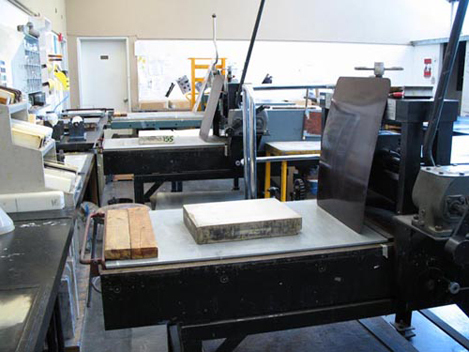 Lithography students have access to two Brand presses and one large Takach-Garfield, as well as a large graining sink, various sized stones, and a hydraulic lift. The intaglio studio includes two Brand presses and one American French, two hot plates, large soaking sinks, a ventilated cleaning hood and a separate acid room fully equipped with drench shower and eyewashes. Three silkscreen stations are available for water-based screening, along with a large spray booth and a separate area for coating and storing light-sensitive materials. 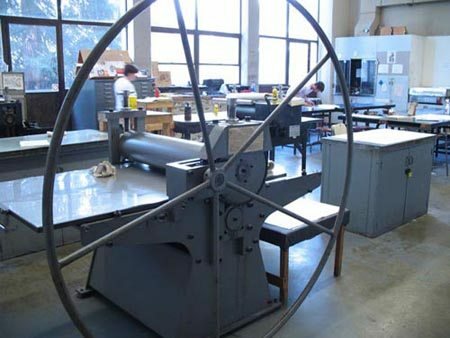 The printmaking program has its own photographic facilities, including a large NUARC flip-top exposure unit for photographic lithography, intaglio, and silkscreen processes, an up to date computer system with the latest graphic software, two large format scanners, and a large format color inkjet printer. 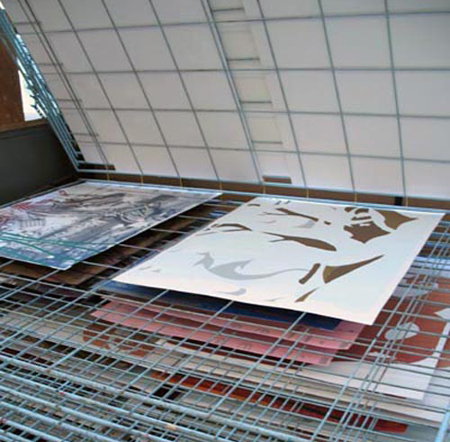 The printmaking program employs a unique rasterizing software called FASTRIP, which allows students to produce high-quality opaque films for photographic exposures. The Digital Media studios occupy two rooms the second floor of Kroeber Hall. 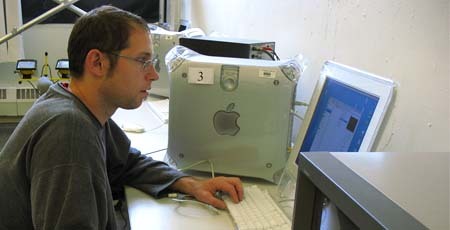 One studio space works as a computer lab with 12 Apple and 3 PC workstations. Software options include Final Cut Studio, Adobe and Macromedia suites, Maya, Max/MSP/Jitter, and more. Eight of the workstations have dedicated DV capture decks with color broadcast monitors. Other available hardware pheripherals include a firewire capture audio interface, midi keyboard, audio reference monitors, audio mixing board, and data projector. The core of the computer lab is a Quad Xenon 64-bit XServe. An adjacent studio functions as a shooting and recording studio as well as a forum for screenings and discussion. The studio offers a large flexible space for video shoots, including a Libec dolly tripod, Mole-Richardson lighting, green screen, skateboard dolly and tracks, and rolling scaffolding. A separate audio recording room houses a hanging vocal recording mic and walls covered in sound-absorbing material. Both studios are on electronic keypads for 24 hour access. The Digital Media studios have equipment available for student check-out, including digital video cameras, lighting kits, audio recording devices, microphones, mic stands, boom poles, and a variety of audio and video production accessories. UCB offers figure drawing, 2-D composition, color theory, and all levels of painting and drawing courses. Berkeley has long been famous for its painting faculty - from luminaries such as Hans Hoffman, Mark Rothko, etc to its contemporary faculty including Squeak Carnwath, Katherine Sherwood, and visitors such as Monica Majoli, Leo Bersamina, etc. Drawing is considered a basic skill for all artists and is required of all majors and minors. Painting and drawing courses take place in Kroeber in four large, double-story rooms with floor-to-ceiling, wall-to-wall windows facing north. The studios are equipped with large sturdy easels, flammable storage cabinets, solvent recycling and washout sinks. The drawing studio is dedicated to dry media. We have ample storage for works-in-progress, as well as plentiful hallway wall space for students to share and critique work with their peers. The sculpture studios at Berkeley offer a superb range of possiblities for learning and fabrication in full range of media and formats. UCB offers traditional techniques in a facility equipped to handle metal fabrication; gas/arc/MIG&TIG welding; wood construction; mold-making and casting; 3D scanning and printing; and ceramic sculpture. 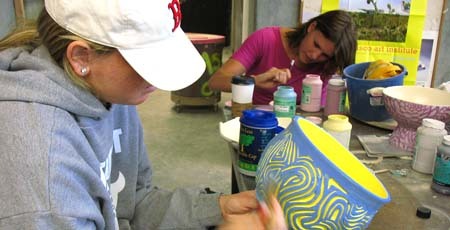 Advanced students are involved in a broadly based course that allows them to pursue individual interests - including mixed-media formats and public art--with an emphasis on further development of concepts, skill, and techniques. The sculpture facilities are located in three large studio/shops located on the ground floor of Kroeber Hall. One shop houses the woodshop and the other a metal shop as well as a classroom, available for student use. The woodshop maintains a large table saw, three bandsaws, stationary sanders, a lathe, radial arm saw, two chop saws, one panel saw, a stationary jig saw and a stationary planer as well as numerous hand tools. The metal shop equipment includes one upright band saw and one horizontal band saw, a lathe, two brakes, stationary grinder/polishers, rotary hole-punch, hydraulic shear, and a milling machine. The metal shop also supports gas, MIG and TIG welding. The third studio/classroom is an open workspace with tables, stools and a display/working wall. Adjacent to all three studios is a large outdoor sculpture yard with rolling overhead crane, forklift and a covered workspace. The Ceramics area provides the possibility of engagement with contemporary art and culture as it interfaces with ceramic media. Students are challenged to experiment with form and meaning in traditional genres, or to originate expanded definitions of ceramics and mixed media, including ceramic elements in performance, architecture, and other installations. The Berkeley ceramics studio, first developed by Peter Voulkos, holds a strong history in Bay area ceramics both with faculty and alumni. Former faculty includes Ron Nagle, Robert Hudson and Jim Melchert and the studio is currently under the tutelage of Richard Shaw. Alumni include Marilyn Levine and Nancy Selvin. Visiting instructors include Ed Blackburn and John De Fazio. The studio consists of a large studio space, advanced student space, pottery wheels, slab roller, extruder, slip mixer and drain table, mold making area, well stocked glaze room with spray booth, five large and three small electric kilns, one medium downdraft and three large updraft gas kilns, large capacity clay mixer, a tile saw and a sandblaster. 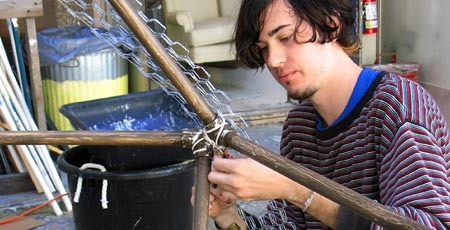 In addition to the main studio there are two graduate student studios, outdoor sculpture yard, and a portable raku kiln. Current research within the ceramics area is focused on image transfer. Current equipment and techniques available to the students includes a computer workstation with scanner and laser printer for printing iron oxide decals and facilities to produce silk screens and print ceramic media. This encourages interdisciplinary work and accommodates a wide range of ideas. New Genres is a practice that begins with ideas and then moves to the appropriate form or media for that particular idea, sometimes inventing entirely new sites of cultural production, new methods, and technologies in the process. Our courses give emphasis to questioning preconceived notions of the role of art in culture and its relationship to a specific form or medium. Works created in New Genres classes take the form of performance, installation, projected image, video, audio, and hybrid or emerging media.